Its not many times when your team outscores opponents 10-5 and you still find yourself on the outside looking in. Sometimes it’s just not in the cards, but not always for a lack of skill and effort. 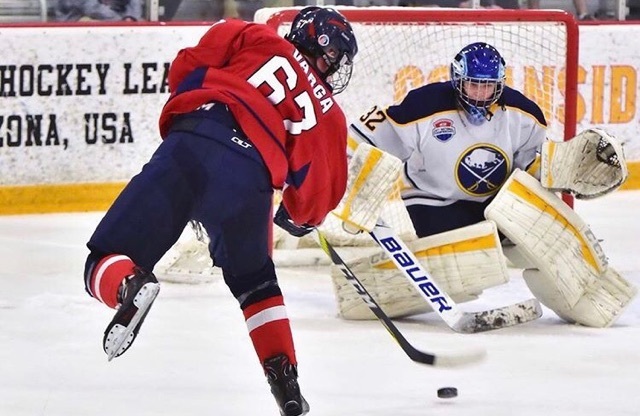 Especially when it comes to the two young men who manned the blue paint for the Buffalo Jr Sabres 15U team in the USA Nationals this past week. Mitch Pulaski and Connor Hasley were those two men. These two Western New York Natives and JSG students helped lead the Junior Sabres in big victories over the Neponset Valley River Rats and Washington Little Capitals. Hasley was a brick wall against Neponset, stopping every shot in the 4-0 shutout victory. Pulaski followed that up making 22 saves on 23 shots, springing the Jr Sabres to a 2-0 record with the 3-1 victory. Unfortunately, and despite a comeback effort, the Jr Sabres would fall short in the third game, dropping a tough 4-3 decision to the Colorado Evolution. Regardless, their play this past week speaks for itself. With a combined 1.97 GAA, Hasley and Pulaski are both deserving of congratulations for their strong performance at Nationals.